Link to and rate our files from your very own website! There are many ways you can link to our website.. Whether it be our Xbox Top 100 websites, Xbox Links section or our Banner Exchance area you can always find images, buttons and other related media to link to our ever expanding site.. The Number "923" in the HTML source references your site's ID number in database. Be sure this number is present. 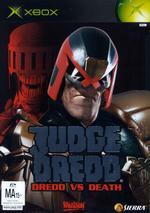 Judge Dredd: Dredd vs Death is an intense first-person shooter set in the future megalopolis of Mega-City One. This 22nd century melting pot is home to 400 million citizens, every one a potential crim..